Review of the evening preview performance on Saturday, March 15 at the New Amsterdam Theatre in New York City. 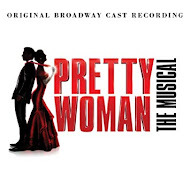 Starring Adam Jacobs, James Monroe Iglehart, Courtney Reed and Jonathan Freeman. Book and Additional lyrics by Chad Beguelin. Music by Alan Menken. Lyrics by Howard Ashman and Tim Rice. Direction and choreography by Casey Nicholaw. 2 hours, 30 minutes including one intermission. It looks like we've entered a new era of Disney musicals, one where an exact replica or an over-blown extravaganza of one of their film properties is not the goal. Gone is the exactness (give or take) of say, Beauty and the Beast or Mary Poppins. Gone, too, is the re-conceptualization of a film, which for Disney has been highly successful (The Lion King) and a miserable failure (Tarzan, The Little Mermaid). Aladdin, which opened yesterday, belongs to the more grounded (and easier to produce in the future) generation, shared by Newsies these days. No one is dressed up like an animal, and there's nary a puppet in sight. But that doesn't mean this latest from the House of Mouse isn't magical, isn't fun or isn't recognizable from its animated counterpart. There is joy and wonder aplenty in this un-apologetically funny, entertaining and occasionally showstopping family musical. 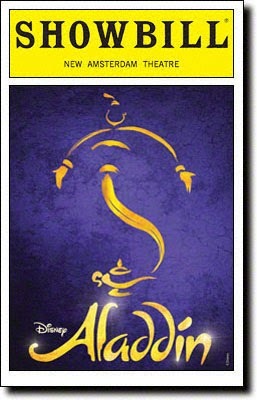 Director/choreographer Casey Nicholaw and his creative team have created what I've read was the film writers' original idea for Aladdin - a vaudeville entertainment mixed with the meta-musical. And if you are willing to accept that concept, you might just realize that there is more here than meets the eye. Yes, you get the same basic plot of the movie and all of the songs are here, too. But you get all of the fun of the vaudeville tradition (misread by some as clunkily old-fashioned). There are the broad stereotypes - the hero and his best buddies, the heroine ready for rescue, the villain who does the "evil laugh" with glee and does everything but twirl his mustache, his comic sidekick, and a variety of lovely girls and muscled boys. You can tell without hearing a word they say who the good guys and bad guys are. There are the even broader, slightly naughty jokes, the anachronistic references to modern things in a decidedly un-modern setting. There are the set changes done behind a front curtain while the "good guys" and "bad guys" alternate in front of it, telling more silly jokes and even, occasionally, advancing the plot. And best of all, there are the eye-popping, gigantic production numbers. There's so much here for adults and musical theatre fans alike to enjoy (a few things might need explaining to the little ones, but most of it will sail right over their heads). Will it advance the art form? No. But it doesn't try to, either. It sets out to entertain audiences of a wide age range, while re-introducing an old-fashioned theatre genre - think The Will Rogers Follies meets 42nd Street meets Oliver! And it succeeds. Back to Mr. Nicholaw for a moment. He has very carefully directed this piece to build and build and build. Each scene gets a little broader or bigger or both. Each big dance number gets a little bigger than the last. The show opens with a dazzling number, "Arabian Nights," notable for its precision moves, amazing formations and thrilling crescendo. And there is the truly magnificent "Friend Like Me," which builds to such a frenzy of dancing thrills and visuals, that the audience leaps to its feet. I haven't seen such a jaw-dropping extended dance number since "The Jellicle Ball," "We're in the Money," or "Springtime for Hitler." Then there is the second act dazzler, "Prince Ali," a parade of hundreds, performed by about two dozen. In short, this is Broadway-style at its very best, and it happens so rarely. Even the smaller-scaled numbers are a joy to watch. And his staging of the scenes in between are just as skillfully rendered, full of action and intricate moves, made all the more exciting by the air of effortlessness with which the cast does them. 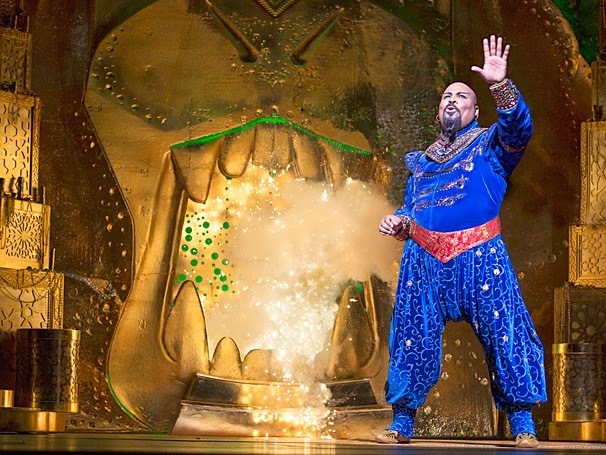 With The Drowsy Chaperone, Spamalot, The Book of Mormon and now Aladdin, Nicholaw has really solidified his place at the current master of the classic musical with the modern sensibility. The design team has also done some very nice work, too. The sets, though not epic in that Disney Park way, suit the material and the concept perfectly. Scenic designer Bob Crowley has created a colorful, faux-exotic world that never forgets it is traditional musical scenery. There are some pretty magical things to behold throughout the scenes, but I won't give them away here; it would spoil the fun for anyone who hasn't seen it. Suffice it to say that there is just enough "Disney magic" to keep your eyes and ears filled. Natasha Katz's lighting is just as beautiful - jewel tones, warm shadows and eerie glowing abound. But the real genius here is the truly amazing cavalcade of costumes designed by Gregg Barnes. Most shows wish they had a whole show with costumes as breathtaking as those displayed here in just one number. 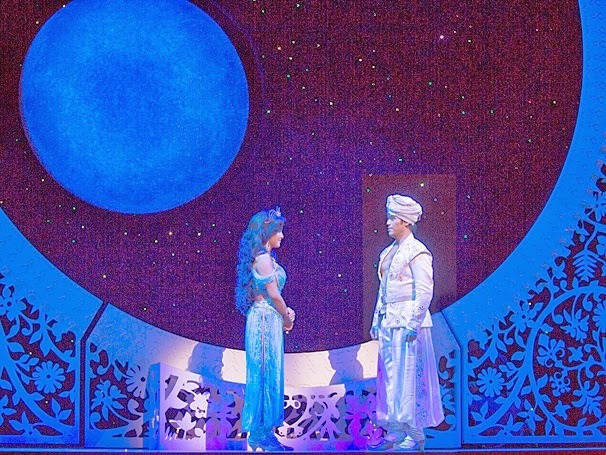 "Prince Ali" is a costuming wonder. The game, energetic cast (they HAVE to be exhausted after each performance) is terrific from top to bottom. The ensemble is 100% full of triple-threats, and they have to be, since they play poor townsfolk, royal courtiers, evil guards, and a parading entourage. They jazz dance, tap dance and throw in some contemporary moves (often all three in the same number) with equal aplomb and stunning dexterity. Stand-outs include Tia Altinay, Andrew Cao, Donald Jones, Jr., Khori Michelle Petinaud, Jaz Sealey, and Marisha Wallace, who play the attendants of Jasmine and the henchmen of Jafar. Stage veteran Clifton Davis returns to Broadway in the guise of a bumbling, but well-meaning Sultan. He does everything he can with a part that really is only intended to fill in the plot line. Playing characters new to this version of the story (they were in the original film concept) - Aladdin's best friends/partner-in-crime - are the energetic Brian Gonzales, Brandon O'Neill and Jonathan Schwartz, who land each groaner of a joke (your mind fills in the rim shots) and the bold physical hi-jinks required with a zeal that is both fresh and of-the-moment feeling. They have two numbers not in the film ("Babkak, Omar, Aladdin, Kassim" and "High Adventure") that are both a lot of fun to watch. And Don Darryl Rivera is a scream as the sharp-tongued Iago, sidekick to the evil Jafar. He's bawdy, nasty and very, very funny - breath of edgy fresh air. Jonathan Freeman growls and grunts his way through the show, vocally nailing the wicked bad guy, Jafar, no surprise since he did the voice in the film. But I have to say, if there is a weak link in the cast, it is him. He seems a little stiff, and more than a little ill at ease in his costume. I'd like to assume he'll loosen up some as the weeks go by, but I was more than a little underwhelmed by his efforts. 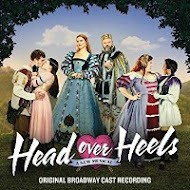 Of course, much of the credit for the fun and success of this incarnation belongs to the classic score by Alan Menken, Tim Rice and the late, great Howard Ashman, whose intelligence, warmth and humor pervade the entire piece. The new songs - many cut from the film - fit the new show nearly perfectly. They are just as smart as the ones you go in knowing. Kudos, too, to lyricist and new book writer Chad Beguelin, who has taken the original film and seamlessly integrated the original idea behind it into a nice fresh telling of the street rat and his princess. Those surprised by the self-awareness and anachronistic nature of the dialog really shouldn't be. The new book borrows heavily from the film, and adds plenty of things that have become a part of American pop culture since the film's release. 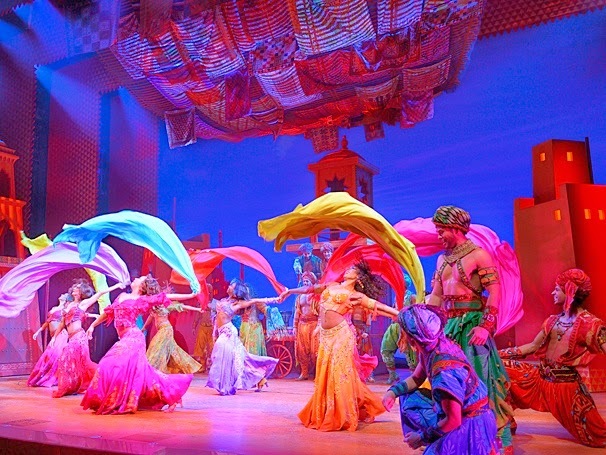 Aladdin the Broadway show is what Aladdin always was - a meta-musical - married with what it was meant to be, a splashy vaudeville-musical comedy. If you like that sort of thing, and don't need every show to be a Sondheim brain-fest, then this bright spot of the season is for you. If not, look for another oasis elsewhere. 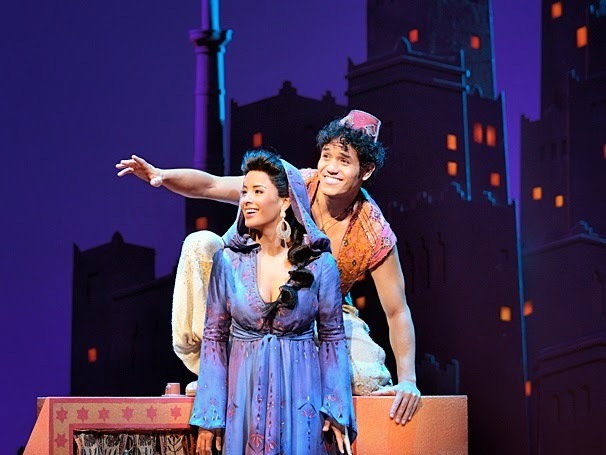 Finally, here is a review that gives Aladdin its deserved credits, recognizing its proper context and its genre. There are some of us common folks who like to go to the theatre to be entertained and to enjoy the magic that Disney creates. I enjoyed this in-depth review, but would disagree that Jonathan Freeman's performance was a little stiff. He played him as familiarly psychotic in the 5th Avenue Theater production in Seattle in what looks to be an equally hard costume, but it looks like Jafar was changed in the Broadway production to be more subtle. If anything, Mr. Freeman has a harder task of still making a splash with the slightly quieter Jafar. 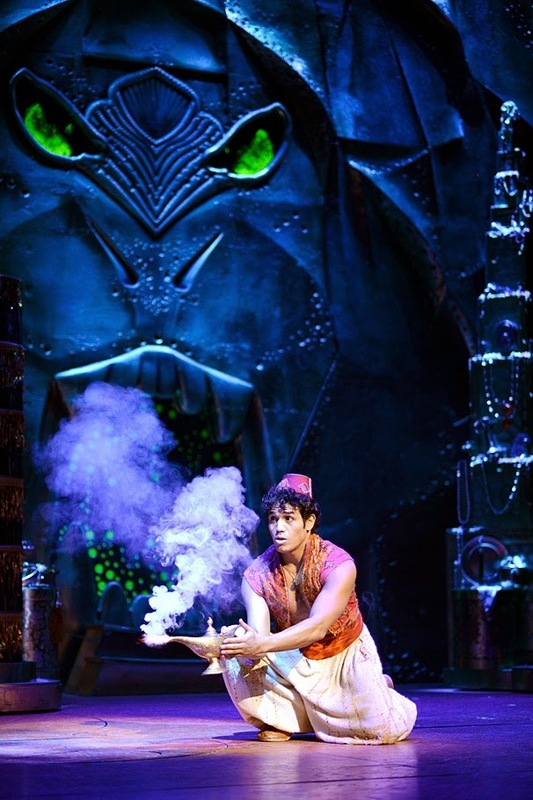 I saw Aladdin on Broadway on opening weekend, and from what I saw, thought Mr. Freeman did an excellent job in physicalizing Jafar, particularly with his hand movements and varying posture. Stiff to me is like a soldier, or a king, and he resembled neither. I am in total agreement with you! Mr. Freeman had a hard task to fill and he executed it well. Another ABBA Musical? "Act One"
The New Tony Nominations Rule: What If...?